Alas, these are the last words of P. Bodie (played by Wes Crawford). Now it's up to you to solve the mystery and recover the "missing note!" 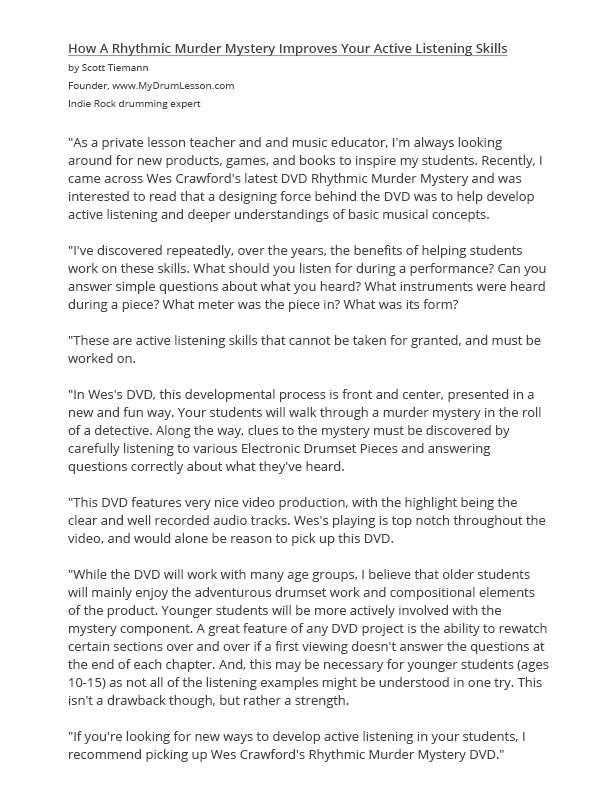 From the creator of the original Drumset Play-Along DVD, Wes Crawford presents still another innovative concept in active listening. 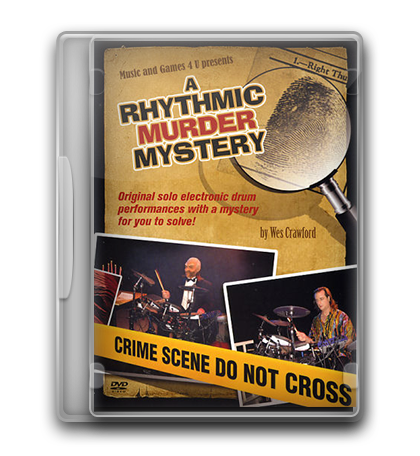 The Rhythmic Murder Mystery DVD contains swinging, swanky, fun and funky electronic drum solos performed by Wes. The wacky narrator (Brian McNelis) presents the unfolding mystery, challenging you to piece together the solution by listening to the music-oriented clues woven into the performance. Originally performed live, this DVD version is an adaptation of Wes's successful "Rhythmic Murder Mystery" one-man show, designed to build active listening skills. The DVD's menu options allow you to play the performance with the narrator, play the pieces without the narration, or jump in at any chapter. Akira Jimbo meets Sherlock Holmes. I highly recommend this entertaining DVD. I checked out the DVD and thought it was a creative and fun idea! I played the game with both of my sons, who also play drums and we all think it's a winner! ...a creative, compelling and fun way to explore rhythm and drumming. For players it is a bit of entertainment not found anywhere else... It has a campiness that has to appeal to any working musician with show experience. 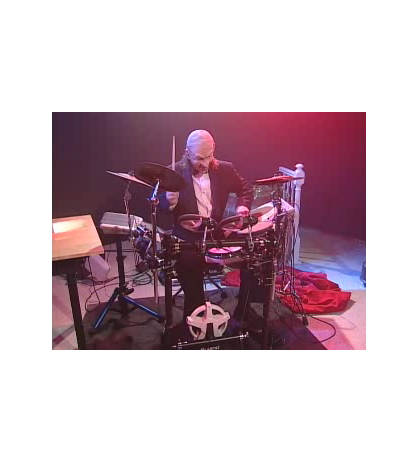 And he plays some powerful rhythms and solos on those electronic drums. The package is worth it for that alone. He's a wonderful player.